"“I never weary of great churches. It is my favourite kind of mountain scenery. Mankind was never so happily inspired as when it made a cathedral"
So wrote Scottish novelist Robert Louis Stevenson. The Medieval churches of England represent a phenomenal achievement. At the Reformation there were some 46,000 of them, in addition to thousands of monastic churches, cathedrals, chapels and abbeys, all raised during a few centuries by a population that numbered around that of present day New Zealand, less than 5 million. About half survive to this day in a reasonable state and we intend to visit them. For those who would like to immerse themselves in the history of England, through the grandeur of its cathedrals and abbeys, or to view the intricate architectural achievements to be found within these special places, then, this tour is a must. Travelling between our visits we will pass through market towns, small villages, woodlands and farmland. All this while we sit back, relax and enjoy our journey. We may even be able to have our lunch breaks in the cafes within the cathedral precincts. Much to see and more to do. Each evening at dinner, in our hotels, we will be able to relive the day and look forward to boarding our air conditioned coach next morning to transport us to that next adventure and I am sure that we will have many surprises on the way. Join me as we traverse across England and visit many of those incredibly beautiful edifices that have survived over the past centuries and now stand in all their restored magnificence. Private behind the scenes guided tours by local experts will further provide us with an insight into the construction, an appreciation for their ongoing restoration and an understanding of their significance throughout history. 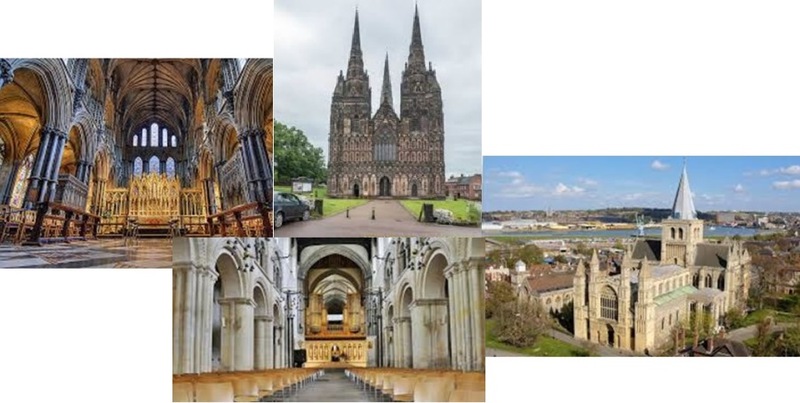 Our travels will take us to visit many of the cathedrals and abbeys and include, Salisbury Cathedral above right, Pershore Abbey above left and also, Exeter Cathedral, Rochester Cathedral, Wells Cathedral, Buchfast Abbey and Truro Cathedral to name but a few. Costs: 16 days/15 nights. Based on share twin or share double AU $6,295.00 per person. Single Supplement additional cost AU $1,500.00. • Tour is Fully Escorted. • Entry to all Cathedral and Abbeys. • Behind the Scene visits. • Guided Tours by local experts. 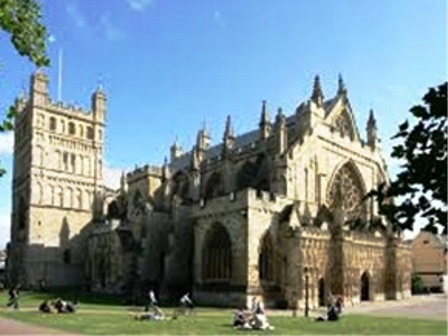 • Opportunity to take part in Cathedral Services. • Travel throughout the beautiful English Countryside. Please note: This itinerary has been prepared on a geographical basis to allow us, over our two (2) weeks together to visit many Cathedrals and a few Abbeys. At each visit we hope to be met and receive a behind the scenes tour from a local guide to take us through the history, architecture and the development of the various orders. 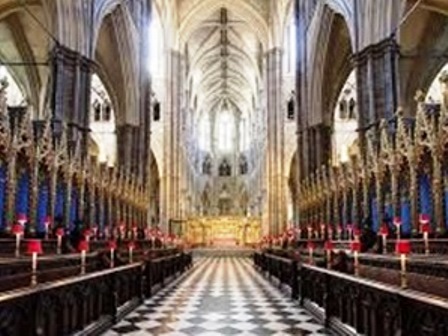 We will endeavour to visit the individual Cathedral or Abbey on a day that allows a guided tour as there are special days or times in the life of both the Cathedrals and Abbeys that preclude such tours. It is hoped that by having a programme as broad as appears below, there may be the flexibility to visit specific sites that are of special interest to those on tour. Sunday 8 September 2019 - SALISBURY to EXETER: This morning we say goodbye to Salisbury as we head to Exeter and our visit to Exeter Cathedral. With the lowering of Christianity in England in the 7th Century through the work of Augustine and Theodore in the South-East and Aidan and Cuthbert in the South-West . However, it was St Boniface, educated in a monastery on the site of the present cathedral who became the most celebrated son of Devonshire by his work as a missionary in Central Germany. Thursday 12 September 2019 - COVENTRY: Our visits today take us to Lichfield Cathedral and then back to Coventry Cathedral. Origins of Lichfield Cathedral lie in the building of a Church in 700 at a shrine for St Chad. From 1085 until the twin spires were finished in 1327 there were many changes and additions and most are preserved to this day. Following our time at Lichfield we will move back to Coventry Cathedral and the building of the Cathedral caught the imagination of people throughout the world, seen as a phoenix rising from the ashes. Visiting is likened to a pilgrimage both unique and symbolic. Stand in the ruins and gaze upon the cross of charred timbers and the cross of nails with two words, “Father Forgive”. The Christian roots of Coventry lie in the foundation of a nunnery by St Osburga. Saturday 14 September 2019 - NORWICH: Today will be another great day enjoying the splendour of our Cathedrals. Our plan is to visit Ely Cathedral but with Ely today and Norwich tomorrow, we must remain flexible as much is happening with the Enthronement of their new Bishop at Norwich Cathedral and other issues at Ely Cathedral. However, as we get closer to the time of our proposed visits, things may change. The "Ship of the Fens" rising from the mist is a name and an image often used to describe Ely's majestic cathedral. 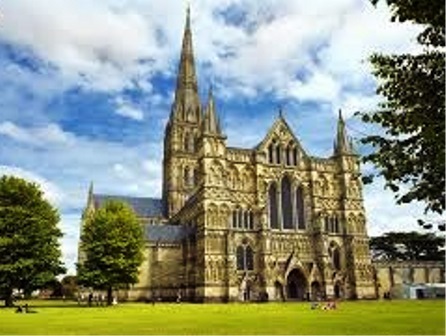 The cathedral took 100 years to complete after the foundations for the nave were laid in 1100. However, much earlier in 673 Etheldreda came to what was an island to set up her double monastery for both men and women. At that time the island was known for its trade in Eels, is this were the name Ely comes from? Tuesday 17 September 2019 - CANTERBURY to LONDON: After a leisurely breakfast we start the run north westwards towards London. On that run in to London we intend to call in to visit Rochester Cathedral. After Canterbury, Rochester is the oldest diocese in England. Augustine sent one of his Monks there to be Bishop in 604. The mortal remains of Paulinus the great missionary to Northumbria are still in this cathedral. 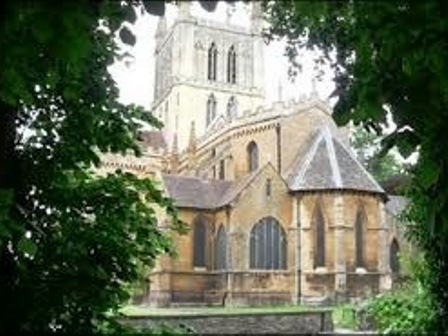 Nothing is visible of the Saxon cathedral and it is the church begun by the Norman Bishop, Gundulf in 1077 of which the earliest remains are visible. Gundulf founded a Benedictine community and set to work on a new Romanesque church. Parts of his cathedral are still visible in the nave arcading. At the Reformation, Rochester produced 2 Martyrs, one from either side of the divide. Bishop John Fisher for the Catholic cause was beheaded by King Henry V111. Bishop Nicholas Ridley was burned at the stake during the reign of Mary Tudor and became a Protestant Martyr. Ridley is commemorated by a figure in the 19th Century quire screen. The new baptistry fresco by Sergei Fyodorov in 2004 is the first to be painted in an English cathedral in 800 years. Wednesday 18 September 2019 - LONDON: This will be a huge day for us as we will be visiting both Westminster Abbey and St Paul's Cathedral. Westminster Abbey is the burial place of Kings and where the Monarch is crowned. It is difficult to exaggerate the significance of its place in National life. A community of Benedictine Monks first settled here in 960. 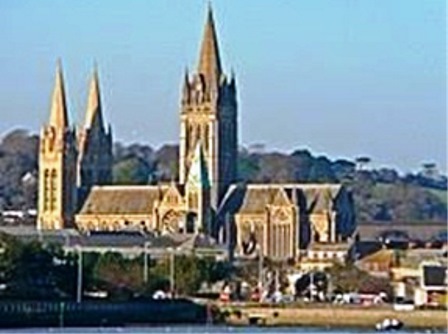 But it was King Edward the Confessor who rebuilt the Abbey in Romanesque style, completing in 1065. He himself died a few weeks later, his shrine is still at the heart of the Abbey. One cannot begin to catalogue the tombs and memorials which find their place in this remarkable building. Alongside Kings stand memorials to countless literary figures in Poet’s Corner; Sir Isaac Newton and other great scientists are remembered in the naïve and then politicians and soldiers complete the catalogue of the makers of English history. The first Church of St Paul was established in 604, was wooden and destroyed and rebuilt many times before a Norman church was constructed on the same site 500 years later, 1087. 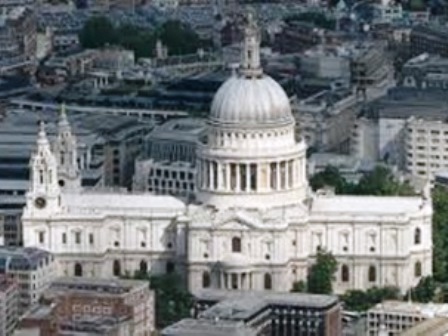 Old St Paul’s was the largest church in the British Isles and 3rd largest in Medieval Europe. The Great Fire of London finally put paid to the decaying building.